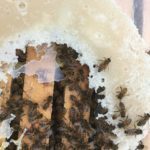 Eugene Brown will be discussing and demonstrating making fondant, dry feed, grease patties and pollen patties for your bees. We’ll also be discussing when you can start using sugar syrup and when to use 2:1 syrup versus 1:1 syrup. Now that Eugene has completed his 4 year commitment as NCSBA Regional Director for the Mountain Region (Thank You Eugene! ), we have a new regional director assigned to our chapter — Doug Galloway, from Watauga County — and he will be joining us as well. Join us for this hands-on workshop and help make Doug welcome! This entry was posted in Beekeeping in NC, Local Beekeeping, Meetings. Bookmark the permalink.